This post provides the notes and resources for a workshop I ran for the Auckland Mathematical Association (AMA) on developing learning and formative assessment tasks for evaluating statistically-based reports (specifically AS91584). The starter task for this workshop was based around a marketing leaflet I received in my letterbox for a local school back in 2014. I was instantly skeptical about the claims being made by the school and went straight to sources of public data to check the claims. As was often the case, this personal experience turned into an activity I used with my Scholarship Statistics students to help them develop their critical evaluation skills. The task, public data I used, and my attempt at answers (from my past self in 2014) are provided at the bottom of this post. My overall conclusion was that most of the claims check out until around 2011, but not so much for 2012 – 2013, leading my to speculate that the school had not updated their marketing leaflet. The starter task is all about claims and data, and not so much about statistical processes, study design, or inferential reasoning – all of which are required for students to engage with the evaluation of statistically-based reports. However, I used this task to set the focus of the workshop, which was to focus on the claims that are being made, and whether they can be supported or not, and why. The questions used for the external assessment tasks for AS91584 (available here) are designed to help scaffold students to critique the report in terms of the claims, statements or conclusions made within the report. Students need to draw on what has been described in the report and relevant contextual and statistical knowledge to write concise and clear discussion points that show statistical insight and answer the questions posed. This is hard for students. Students find it easy to write very creative, verbose and vague responses, but harder to write responses that are not based only on speculation or that are not rote learned. We see this difficulty with internally assessed tasks as well, so it’s not that surprising that students struggle to write concise, clear, and statistically insightful discussion points under exam pressure. Perhaps we focus our teaching too much on content, keeping aspects such as margin of errors and confidence intervals, observational studies vs experiments, and non-sampling errors too separate? Perhaps we focus too much on “good answers” to questions about statistical reports, rather than “good questions” to ask of statistical reports? When I taught statistical reports in 2013 (the first year of the new achievement standard/exam), I was gutted when I got my students’ results back at the start of 2014. I reflected on my teaching and preparation of students for the exam and realised I had been too casual about teaching students how to respond to questions. In particular, I had expected my “good” students would gain excellence (the highest grade – showing statistical insight) because they had gained excellences for the internally-assessed students or were strong contenders to get a Scholarship in Statistics. So, a bit later in 2014, when the assessment schedules came out, I looked carefully at what had been written as expected responses. To me, it seemed that a good discussion point had to address three questions: What? Why? How? Depending on the question being asked, the whats, whys and hows were a bit different, but at the time (only having one exam and schedule to go with!) it seemed to make sense. 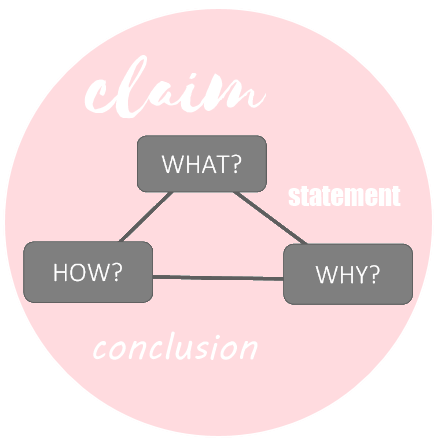 At least, in my teaching that year with students, I felt that using this simple structure allowed me to teach and mark discussion points more confidently. You can see more details for this “discussion point” structure in the slides.